BLOODSHOT STORIES is available for pre-order from Sunshot Press and on Amazon. Jeff P. Jones discovers the compelling themes of his Bloodshot Stories in wildly various locations, but always on the dark side. We read about a zombie on the high plains, the wide-ranging effects of an atomic explosion, a researcher examining Stalin’s early life to find his origins as a serial killer, a dying atheist’s grim final letter to his daughter, an old woman recalling her life while holding her pulsing heart in her hand. The subjects are mysterious and morbid but the prose is beautiful, and there are no missteps in this powerful and impressive collection. Jones delivers a collection of fables, gothic tales and mind-bending surreal stories. 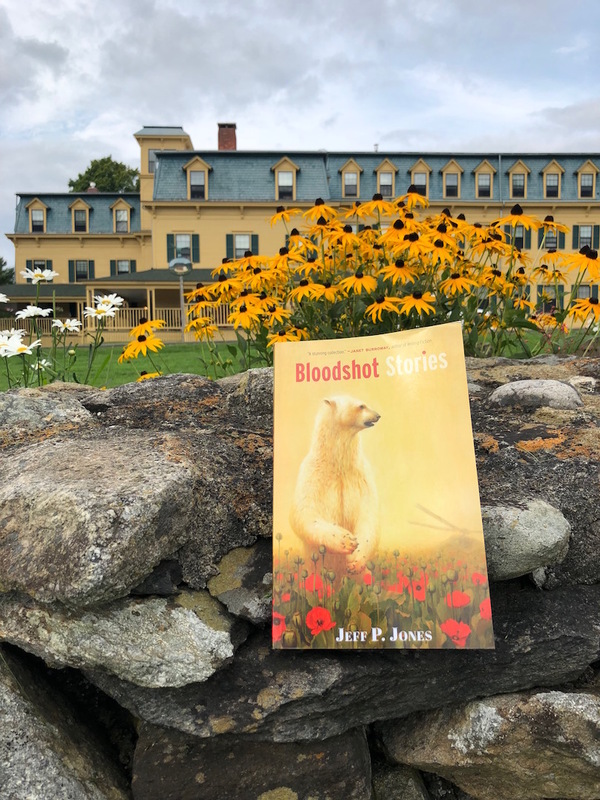 "Bloodshot Stories" was a first-place winner in the category of Fiction (Short Stories) at the 2017 Sunshot Book Awards, and readers will find out just why when they delve into the dark, intelligent mind of Jones, one of Idaho's pre-eminent storytellers. The tales in Jones’s debut short story collection range from the creepy to the cerebral, from the fantastic to the quasi-historical. Each different world showcases the author’s versatility and range brilliantly. What you are reading is where and when you are—everything else falls away like grains of sand through your hand. There isn’t one bad egg in this baker’s dozen, each story solid and satisfying enough to stand on its own. Dec. 11, 2018 - PEN America names BLOODSHOT STORIES a semi-finalist for the Robert W. Bingham Debut Fiction Award. Wednesday, Oct. 24 - BLOODSHOT STORIES premiere reading at BookPeople of Moscow. Thank you, Moscow friends, for coming out. Fall 2018 - Cover article for The Writer's Chronicle: "At the Highest Point of Tension: The Art of the Artful Pause." This article now appears in Writing for the Reader. Aug. 19, 2018 - Reading from the novel-in-progress, Stars, Hide Your Fires, at the Bread Loaf Writers' Conference. 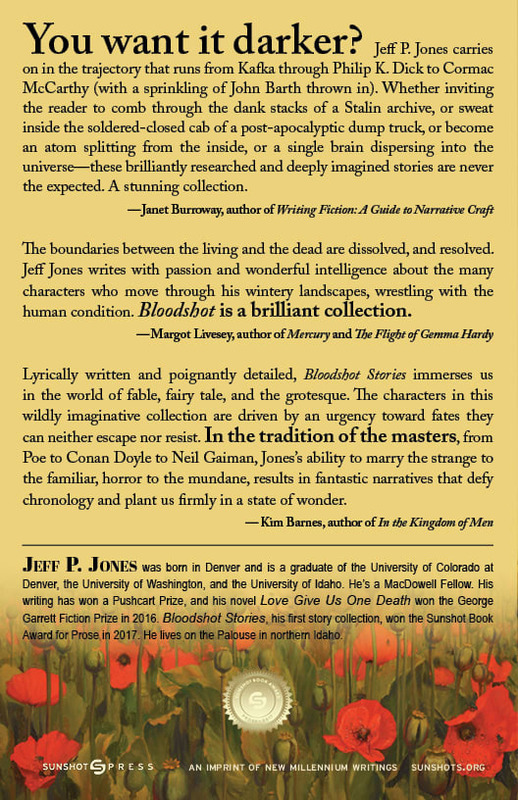 October, 2017 - Jeff P. Jones's short story collection BLOODSHOT STORIES wins the Sunshot Prose Prize. Buy on Kindle or as a paperback. Grounded in the concept of deliberate practice, this guide is for the writer who wants practice in the 36 craft techniques that matter most in good prose. JEFF P. JONES was born in Denver, and received degrees from the University of Colorado at Denver, the University of Washington, and the University of Idaho. He’s a MacDowell Fellow, a Bread Loaf Fellow, and his writing has won a Pushcart Prize, as well as the Hackney, Meridian Editors', A. David Schwartz, Wabash, and Lamar York prizes. He lives on the Palouse in northern Idaho. 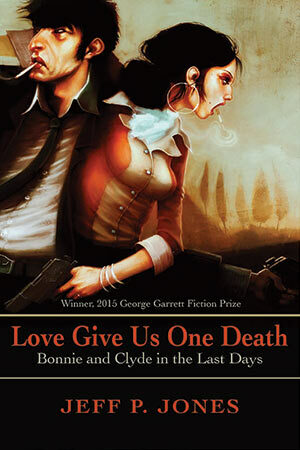 Love Give Us One Death is his debut novel. 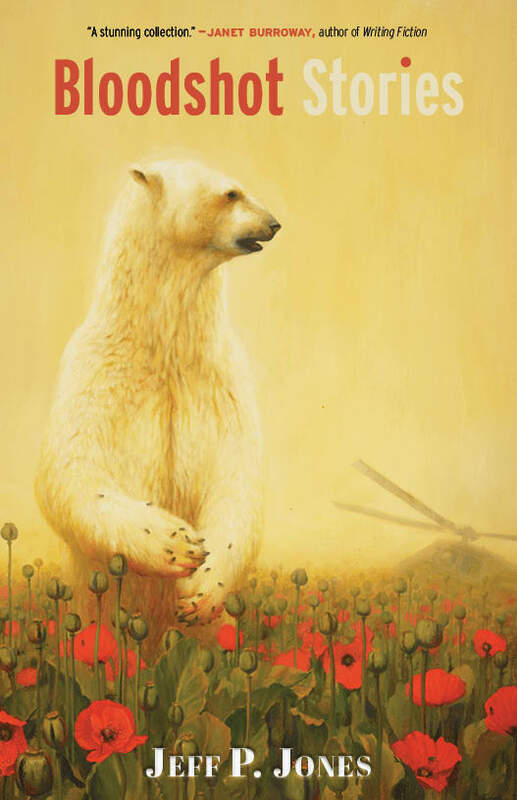 Bloodshot Stories is his debut story collection. Bonnie and Clyde are the most famous outlaw pair in American history. Frank Hamer, the legendary Texas Ranger, was hired to stop them. The story of their death on a lonely Louisiana back road, as well as their bloody and short life together, is a story of a nation reaping the results of environmental degradation, injustice, and greed. Part prose, part verse, replete with fragmentary interludes, newspaper stories, unpunctuated meditations, transcripts, play-like exchanges, and even a vintage cartoon, Love Give Us One Death delivers not only a knock-out story of brutal adventure, and love, across the heartland of the Great Depression, but a story about the very character of the republic itself. In Love Give Us One Death, Jeff P. Jones pieces together a story we think we know, about desperate lives and American violence. As the tale unfolds, we see its larger dimensions: the spiritual shadows and compulsive needs from which our nation springs and through which it has found its many forms of speech. This is historical fiction raised boldly to the level of myth. [This] is the history of love and destruction you didn’t know you needed. In a time of Public Enemies, we see the last legs of a journey between the violent and manic Romeo and Juliet-like pair. The last public outlaws are riding away into their last sunrise, and this book serves as its journal. "This novel was born out of a desire to reanimate the speech of my ancestors." The author's lexical research process described in a Research Note, "The Word Trap and the Novel," for Necessary Fiction. "Two people riding in a car gunned down by six officers who fired a collective 137 bullets. The parallels are striking, but the differences are even more striking. For one, Russell and Williams were black. This was 2012, not 1934." Brief interview on race and Bonnie and Clyde for It's a Jenn World. "What Clyde suffered in prison made him into the cold-blooded killer he was never meant to be, and twelve men, most with families, lost their lives because Clyde vowed never to return to prison—that’s how desperate he was to stay free." Well worth reading. 5 stars. A compelling read from first page to last...very highly recommended. If you are a fan of historical fiction, you must secure a copy. This excellent book should be read by anyone with an interest in postmodern fiction or experimental narrative forms, the story of Bonnie and Clyde, or American outlaws in general. The breathless, seemingly fragmented, writing reflects Bonnie and Clyde’s personalities better than any traditional prose could. Jones’ descriptions breathe life into the sights, smells and sounds of rural life at the beginning of the Great Depression, from boiled greens to burning tires. Jeff P. Jones is keenly aware that his subjects are monsters, but his historical fiction puts them in a context of Depression-era poverty and despair, portrayed in a narrative that ranges from poetic to plainly historical.